This article is about Charleston (disambiguation). For other uses, see Charleston, Missouri (disambiguation). After purchasing 22.5 acres (91,000 m2) for $337, Joseph Moore laid out Charleston in 1837. Some say the community derives its name from nearby Charles Prairie, while others believe the name is a transfer from Charleston, South Carolina. In 1845, it was selected as the county seat and a post office named Charleston has been in operation since 1847. The Battle of Charleston was fought on August 19, 1861. Killed in the battle was one Union soldier and thirteen Missouri State Guard soldiers. On September 1, 1861, Confederate General M. Jeff Thompson robbed the Union Bank of Charleston. Thompson, who handed the cashier a note, gave the cashier an hour to get approval from superiors to give him keys to the vault. After receiving the money, he left a receipt for $57,000 and discovered later that only $56,000 was in the bags. The city was the epicenter of the October 31, 1895 6.6 earthquake on the New Madrid Seismic Zone. The quake damaged virtually every building in Charleston, creating sand volcanoes and cracking a pier on the Cairo Rail Bridge. In addition, chimneys toppled in St. Louis, Missouri; Memphis, Tennessee; Gadsden, Alabama; and Evansville, Indiana. The fate of specific buildings may also be traced by Sanborn Maps that were produced of the town during this period. This was the largest quake since the 1812 New Madrid earthquake, which measured at 8.3 and was the biggest recorded quake in the Contiguous United States. One of the most visible signs of the quake is located south of Charleston at Henson Lake, which was greatly expanded by the quake. In 1901 the county courthouse was built. It was designed by J.B. Legg, who designed numerous buildings throughout Missouri including the Gasconade County, Missouri and St. Charles County, Missouri courthouses. On February 10, 1997, the courthouse was damaged by fire and was subsequently torn down. The Hearnes Site, Missouri Pacific Depot, Moore House, and Jacob Swank House are listed on the National Register of Historic Places. 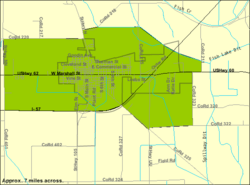 According to the United States Census Bureau, the city has a total area of 4.86 square miles (12.59 km2), of which, 4.80 square miles (12.43 km2) is land and 0.06 square miles (0.16 km2) is water. As of the census of 2010, there were 5,947 people, 1,705 households, and 1,107 families residing in the city. The population density was 1,239.0 inhabitants per square mile (478.4/km2). There were 1,883 housing units at an average density of 392.3 per square mile (151.5/km2). The racial makeup of the city was 47.55% White, 50.45% Black or African American, 0.03% Native American, 0.32% Asian, 0.61% from other races, and 1.04% from two or more races. Hispanic or Latino of any race were 1.78% of the population. The median age in the city was 37.1 years. 20.3% of residents were under the age of 18; 9.6% were between the ages of 18 and 24; 32% were from 25 to 44; 26.4% were from 45 to 64; and 11.6% were 65 years of age or older. The gender makeup of the city was 61.3% male and 38.7% female. As of the census of 2000, there were 4,732 people, 1,834 households, and 1,228 families residing in the city. The population density was 1,011.8 people per square mile (390.4/km2). There were 1,957 housing units at an average density of 418.5 per square mile (161.5/km2). The racial makeup of the city was 53.11% White, 45.60% African American, 0.04% Native American, 0.27% Asian, 0.02% Pacific Islander, 0.15% from other races, and 0.80% from two or more races. Hispanic or Latino of any race were 1.10% of the population. There were 1,834 households out of which 32.9% had children under the age of 18 living with them, 39.0% were married couples living together, 24.8% had a female householder with no husband present, and 33.0% were non-families. 30.6% of all households were made up of individuals and 16.0% had someone living alone who was 65 years of age or older. The average household size was 2.50 and the average family size was 3.13. In the city, the population was spread out with 30.2% under the age of 18, 8.5% from 18 to 24, 24.6% from 25 to 44, 20.8% from 45 to 64, and 16.0% who were 65 years of age or older. The median age was 35 years. For every 100 females there were 82.6 males. For every 100 females age 18 and over, there were 74.7 males. The median income for a household in the city was $21,812, and the median income for a family was $28,178. Males had a median income of $25,908 versus $17,292 for females. The per capita income for the city was $12,876. About 21.2% of families and 26.0% of the population were below the poverty line, including 41.3% of those under age 18 and 16.8% of those age 65 or over. 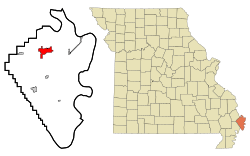 Charleston, Missouri Facts for Kids. Kiddle Encyclopedia.